M. Kerber, D. Morozov, A. Nigmetov. Geometry Helps Compare Persistence Diagrams. Accepted to ALENEX 2016. Link to software repository: Hera  M. Kerber, A. Nigmetov. Metric Spaces with Expensive Distances. Submitted to SoCG 2019. 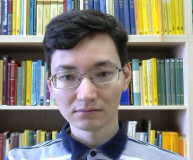 A. Nigmetov, D. Morozov, Merge Tree Computation on AMR Data with Local Excnahges. A. Nigmetov. Analysis of Tensor Decomposition for 3D Human Face Modeling. Master's thesis, Saarland University, 2014. Advisor: Stefanie Wuhrer.